This article is now being featured on www.islamophobia-watch.com, which posts articles regarded as exhibiting lèse-majesté towards matters Islamic. Admani’s common-sense advice  for instance, that prayer rooms should be open to all, not just Muslims, and that speakers should be vetted  were seemingly ignored by most academics and officials. So what he had observed continued: university after university provided Muslim prayer rooms that were all too often taken over by extremists who changed the locks, showed innocent freshers heavy-duty propaganda films of Muslim suffering at the hands of wicked Jews, Americans and Brits, and brought to the campus inspirational speakers who encouraged the young to sacrifice themselves for Allah. Then there was Professor Anthony Glees who, four years ago in his book When Students Turn to Terror, named more than 30 universities where “extremist and/or terror groups” were to be found. He was denounced by the National Union of Students and met with hostility from the academic establishment. The following year, when an all-party parliamentary commission reported on the rise in anti-Semitism that was accompanying increasing support for Islamism on campuses, in the words of its chairman, the respected Denis MacShane, “university vice-chancellors and the university lecturers’ union pooh-poohed our concerns”. And when the Government finally became alarmed, its suggestion that academics should keep an eye on their students and report signs of extremism was angrily rejected by the same union (University and College Union), which boasts a substantial minority who want an academic boycott against Israel. And all this denial has continued, despite a steady stream of evidence about the university background of notorious jihadists like Ahmed Omar Saeed Sheikh, the murderer of Daniel Pearl (London School of Economics), the London bomber Mohammad Sidique Khan (Leeds Metropolitan), Kafeel Ahmed (Cambridge), who blew himself up at Glasgow Airport, and Omar Rehman (Westminster) now serving 15 years for conspiracy to blow up several UK and US targets. There are close to 100,000 Muslim students in the UK, and extremists are swimming among them. 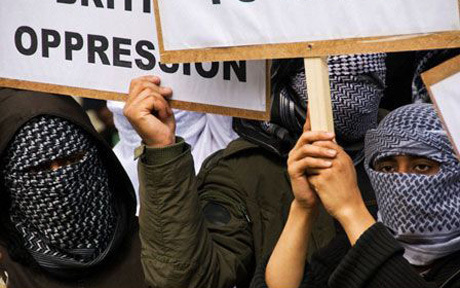 In the work of radicalisation, the agents of the controversial Hizb ut-Tahrir  which works to set up a global caliphate  infest the campuses of Britain unchecked. The truth is that a mixture of greed, knee-jerk Left-wingery, anti-Semitism and pusillanimity have combined to make our universities breeding grounds for Islamism. The greed is two‑fold. Starved of funds and bullied by the Government into dropping standards in the name of social and ethnic diversity, universities court more foreign students than they can cope with and do nothing to upset them. Equally alarmingly, they woo benefactors from such rotten societies as Iran and Saudi Arabia. In A Degree of Influence: the Funding of Strategically Important Subjects in UK Universities, the Centre for Social Cohesion revealed how universities have been seduced by vast sums of money from Arabic and Islamic sources. At Cambridge and Edinburgh, for instance, appointees of Prince Alwaleed, the Saudi principal donor of the Islamic Studies centres, sit on the management committee. The Al-Maktoum Institute, which has its degrees validated by the University of Aberdeen, exists to disseminate the political and religious vision of Sheikh Hamdan Bin Rashid Al-Maktoum, deputy ruler of Dubai. The School of Oriental and African Studies (SOAS) in London ordered the removal from an exhibition of a photo taken by a Saudi artist lest it insult Muslims. The anti-Western and anti-Israel propaganda emanating from some SOAS academics and students has made a once-great institution a joke. The editor of its student newspaper assures us that because of its wicked past as a facilitator of colonialism, the school has gone through a process of intellectual reorientation. Its “mentality and values”, we are told, “now seem to reflect an acute awareness of the subtle forms that racism can take.” That seems to mean that anyone with a claim to be an underdog can do and say anything they like. Academics tend towards the Left and, for a variety of perverse reasons, the Left has allied itself with radical Islam, choosing to ignore the brutality, the oppression of women, the stifling of dissent and many of the other repellent aspects of countries ruled by Sharia law. There will always be a substantial body of students who are idealistic, radical and hot-headed, but all too many academics seem incapable of grasping that the Islamist variety is a threat to the very foundations of democratic society: even the worst of the small number of student lunatics in the late Sixties were not suicide bombers intent on random mass murder. Worse still, fearful of being accused of racism and cultural insensitivity, the academic establishment is running scared of Islamic bully-boys. Supporters of the BNP would be run off campuses where there are no rebukes for proponents of Islamic fascism and murder. Society has always laughed at the unworldliness of ivory towers, but the times are too dangerous now for such indulgence. If vice-chancellors of universities that contain festering ideological cesspits do not clear them out, they should be replaced. Umar Farouk Abdulmutallab was by all accounts a decent, virtuous teenager who wanted to do good but, lost and alone in London, he fell into a malign embrace. Indifference, cowardice and neglect on the part of those who should have protected him may have contributed to the causes that turned him into a would-be agent of death. Rather than producing mealy-mouthed defensive statements, it is my personal opinion that Provost Grant should seriously reconsider his position. And the heads of all those universities who are duty-bound to prevent the corruption of confused young men in their care should have the decency to admit their failures and follow suit.